As the 20th century began, the Toledo, Ann Arbor and North Michigan Railway extended from the Ohio city to Elberta, where rail ferries transported the trains across Lake Michigan to Manitowoc, Wis., or Menominee in the Upper Peninsula. When the trains departed nearby Beulah for Elberta, they followed Crystal Lake and within a few miles made a sharp swing southwest at a bend in the shoreline that locals referred to as Railroad Point. The name stuck even after rail service had disappeared by the 1980s. What eventually replaced the boxcars were cyclists, hikers and other trail users on one of the most scenic sections of the Betsie Valley Trail in an area that was eventually preserved as Railroad Point Natural Area. 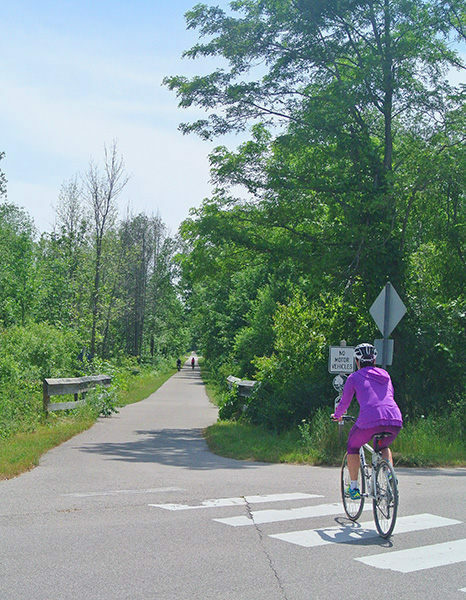 Built after the Michigan DNR purchased the abandoned rail corridor in 1998, the Betsie Valley Trail extends 22 miles from Frankfort to Thompsonville, passing through Beulah and Elberta and near Benzonia. Highlights for many are the 3-mile stretch along Crystal Lake and the numerous views of Betsie Lake and Betsie River. Mile 0 of the trail is at 10th Street in Frankfort, where it officially becomes the DNR-owned Betsie Valley Trail. 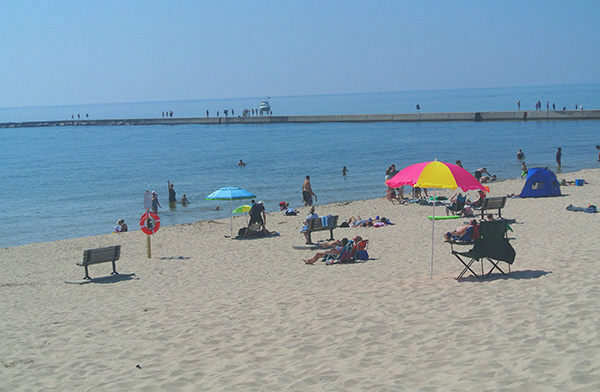 A connector trail continues west through Frankfort’s waterfront parks on Betsie Lake and along Waterfront Drive for three blocks to provide access to the Lake Michigan beach in Cannon Park. The trail from Cannon Park to Mollineaux Road (6.7 miles) features an asphalt surface suitable for road bikes, inline skating and parents jogging with a young one in a carriage. 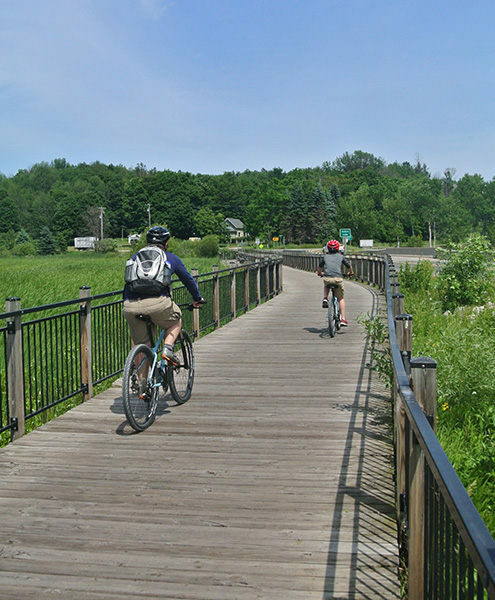 From 10th Street, the rail-trail skirts the south end of Betsie Lake pass Mile 1 and parallels M-22 briefly as it crosses Betsie River via a boardwalk with an observation area in the middle for the lake and surrounding marsh. At the west end of the boardwalk the trail passes the entrance of Lakeshore Recreation Area where there are toilets and picnic tables before crossing M-22 to the Elberta trailhead on the other side. You then swing east to re-cross the mouth of the Betsie River a second time, passing another observation area. For the next 3 miles the rail-trail parallels River Road and then crosses it at Mile 4 to the DNR boat launch on the river that doubles as a trailhead. Additional views of the Betsie River are enjoyed before the trail crosses M-115 and arrives at the trailhead on Mollineaux Road. A third of a mile to the east on Mollineaux Road is the trailhead for the Mary Margaret Johnson Trail, the start of a short hike to views of Crystal Lake from Railroad Point Natural Area. Beyond Mollineaux Road, Betsie Valley Trail switches to a limestone aggregate surface and for the next mile hugs the shoreline of Crystal Lake as it passes through the natural area. From the rail-trail there is easy access to the lake and a swimming area along this stretch. For the remaining 2 miles to Beulah the rail-trail winds through private property on a 10-foot easement with special-use restrictions, including a ban on dogs and a 10 mph speed limit, that are posted for trail users. Within view of Crystal Lake most of the way, this portion of the Betsie Valley Trail can be very sandy in places. 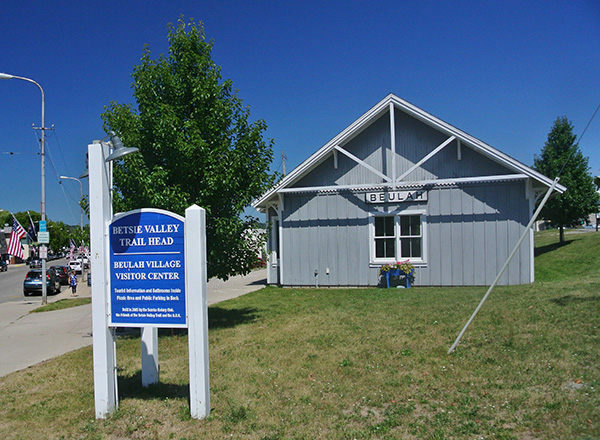 At Mile 9, the Betsie Valley Trail enters Beulah and arrives at a replica of the town’s former railroad depot that serves as a trailhead and visitor’s center with information, maps, restrooms and drinking water. Restaurants and a public swimming beach are nearby. Two blocks from the depot the Betsie Valley Trail crosses US-31. The aggregate trail swings south and then resumes its easterly direction at Mile 10 with a gradual ascent for the next 5 miles to Aylsworth Road, much of it in the Pere Marquette State Forest. The trail crosses Dair Creek at Mile 17, where a wooden stairway descends to a beaver dam across the stream. Just before entering Thompsonville is an old turbine at Wolf Road that produced the first electricity in the area. The Betsie River is then crossed via a renovated railroad bridge and the rail-trail arrives at its east end on Thompson Avenue, one block south of Lindy Road. There are parking areas and information signs at all the trailheads. The 10th Street trailhead is adjacent to the large city of Frankfort boat launch with restrooms, drinking water and its own parking lot. The Betsie Valley Trail is open year-round and there are no user fees. There are six designated trailhead parking areas for the Betsie Valley Trail, including on 10th Street just south of Main Street in Frankfort. Other trailheads, where parking is available, are at Mile 1 along M-22 in Elberta, at a DNR boat launch along River Road just past Mile 4, on the north side of Mollineaux Road at Mile 6, at the Beulah Visitors Center on Benzie Boulevard and at the trail's southern end in Thompsonville where there is parking at the ball field just north of Lindy Road (County Road 602). Additional information on the trail is available from the web site of the Friends of the Betsie Valley Trail or the Benzie County Visitors Bureau (800-882-5801).